Hi!!! 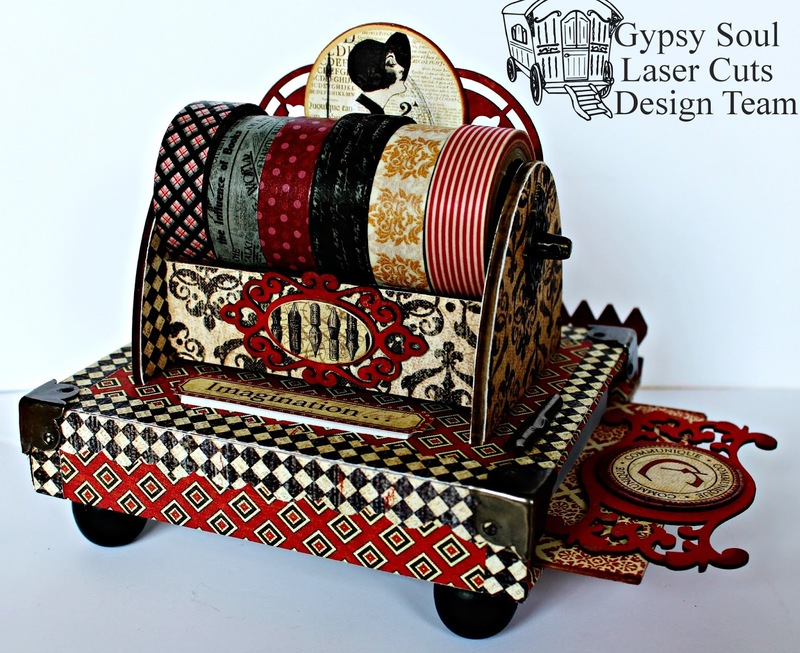 Pam today here on the Gypsy Soul Laser Cuts Blog sharing with you a fun Washi Tape/Memo Station. 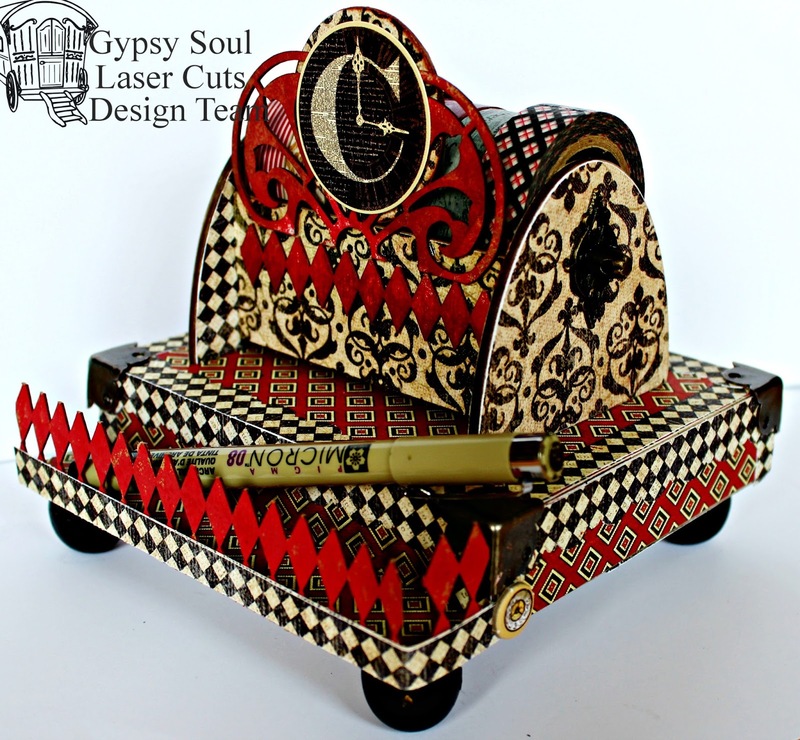 I love combining the fabulous dimensional chipboard pieces that are found in the Gypsy Soul Laser Cuts Store. Today I am using the Business Card Holder and combining it with the Square Shrine Shadowbox. 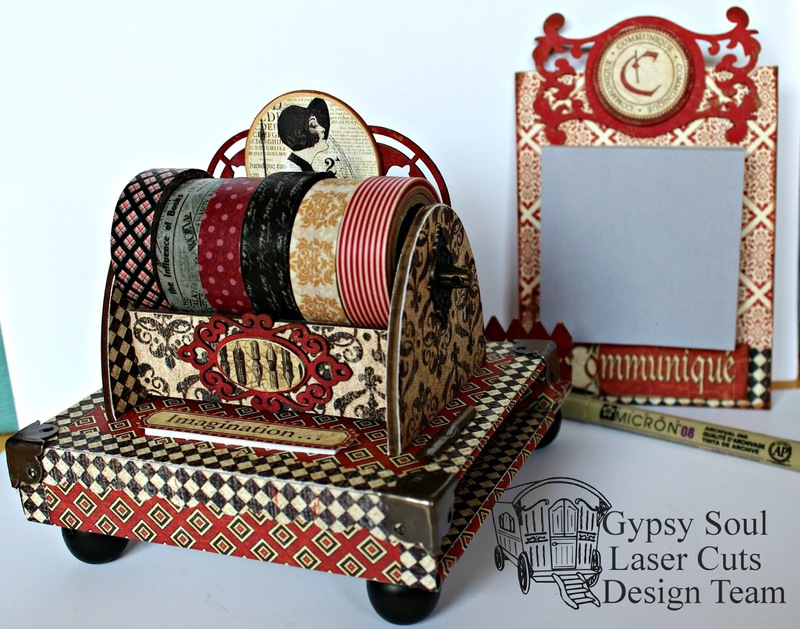 Begin by covering the Business Card Holder and the Square Shrine Shadowbox using Graphic 45 Communique pattern papers. Paint the half of one of the Tudor Rose Singles and a Stackable Label Shape from the set with Picket Fence and with Fired Brick. Allow to dry. Ink edges of all chipboard pieces with brown ink. Add prepared Tudor Rose Singles to back of Business Card Holder. Adhere Stackable Label Shape to front of Business Card Holder. Adhere strips of paper and scallop border strips to sides of covered Square Shrine Shadowbox. Adhere paper and border strips to inside of Square Shrine Shadowbox. Add metal corners to Square Shrine Shadowbox. Adhere the prepared Business Card Holder to top of prepared Square Shrine Shadowbox. Cut tab of one of the Memory Keeping Organizer Larger Divider and cut down to fit inside of Square Shrine Shadowbox. Paint Stackable Label Shape and Diamond Texture Sheets with Picket Fence and Fired Brick paint. 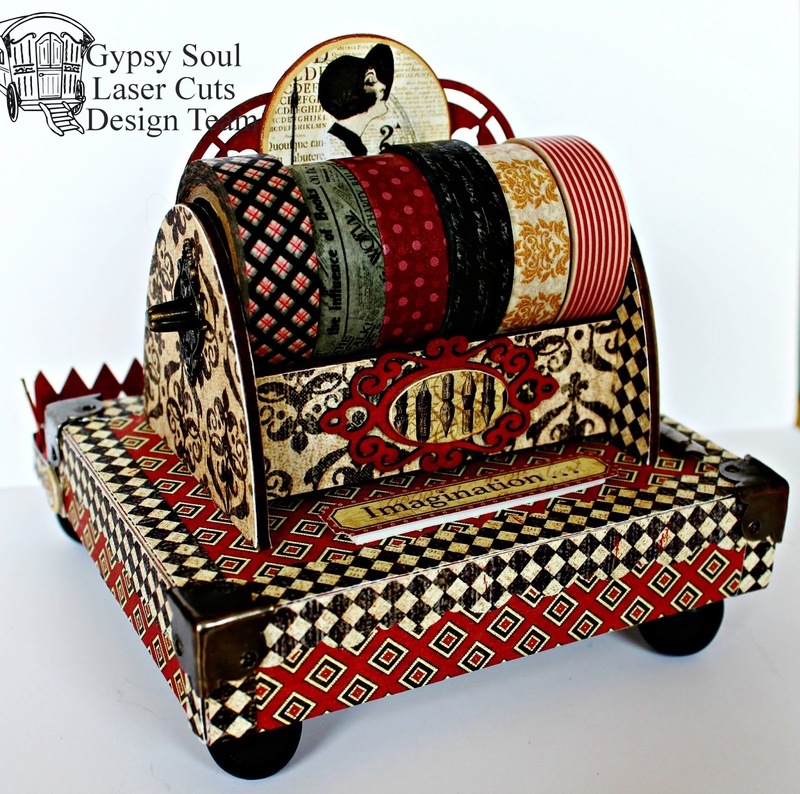 Cover circle with image from pattern paper, layer the Stackable Label Shape together. Adhere to top of prepared Memory Keeping Organizer Larger Divider. Fussy cut "Communique" image twice from pattern paper. Layer together with pop dots, adhere to top of Memory Keeping Organizer Larger Divider. Add Post A Note stack to center of Memory Keeping Organizer Larger Divider. Place inside of Square Shrine Shadowbox. Adhere prepared Diamond Texture Sheets to form pen holder along with a small pattern paper border strip. 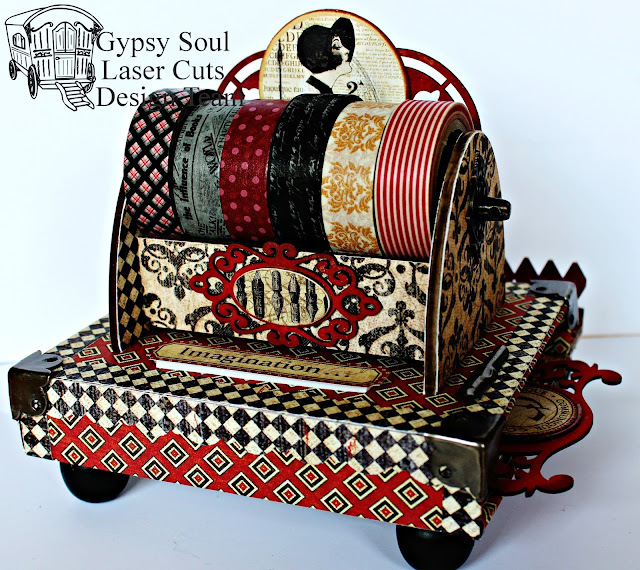 Adhere wooden ball legs to bottom of Communique Washi Tape/Memo Station along with pens. Add a few of the Communique Stickers and Chipboard to the Washi Tape/Memo Station. This is incredible. I love it.